Since moving to Cuffern Manor in August 2004, we have been researching the history of the house. It would appear that the present house was built around 1770 by John Rees Stokes. This has led to two different areas of investigation: The House And Its Occupants and The Stokes Family. 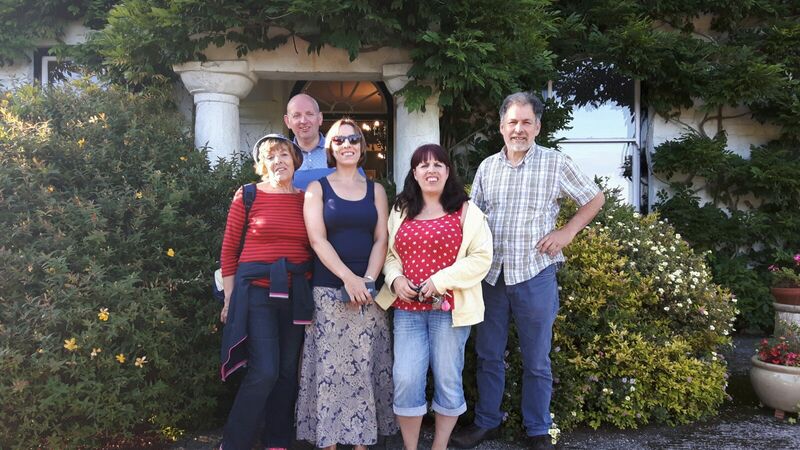 The Barath family paid a visit in the summer, Billa and her two daughters and son-in-law.Emma wrote “It was an emotional visit for my Mum who’s only regret in life (she tells me) was leaving The Cuffern and Pembrokeshire. We think the property is looking really well loved and cared for and I hope everything works out well for you.” The sisters were both under 10 when they left but had lots of memories as well. 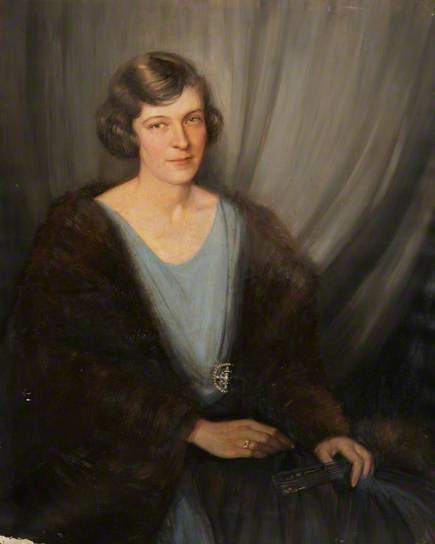 Mary Roberts, now living in Herefordshire, stayed here for a family wedding, being held in Tenby. 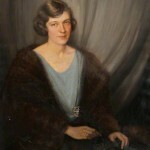 She was able to tell us a few things about William Harries Owen who owned the Manor until 1936. He built Ashleigh House, just after the turning to Keyston, on the left towards Haverfordwest. His two daughters, Glenys, a nurse married to a Fishguard Outfitter, and Doreen, married to a bank manager, had no children. Of the Manor’s 93 acres – 36 were rented to T.H.Roach. William Owen married to Beatrice who was a Roberts and the sister of Mary Roberts, grandmother of our guest, also Mary. Both the Roberts and the Wades feature heavily in the pamphlet -Lives of Great Men, A History of the Keyston United Reformed Church by W.L.Richards. Howard Wade of Wolfsdale married Evelyn Roberts of Dudwell Jack Roberts, Mary’s father, became treasurer of the Chapel in 1943, a post held for 43 years. We are still not clear when William Owen bought the estate or why. Mary said it was his private house – so a downsize and some when he left in 1936! The tree just fell apart one morning when we were out and the builkders heard terrific rumbling and cracking. The fire , October 2014. Its not yet history but it will be so we’d better get the full story in here for the record. Being the third significant fire in just over 100 years, in 1899 the engine taking one hour to get here from Haverfordwest, in 2002(?) had they been here 10 minutes later the house would not have been saved and on October 14th no less than five engines and one water tender arrived pretty swiftly following a call from Paige at about 4.30 pm. Crews from St Davids, Haverfordwest, Narberth, Milford were called on. She had left about 8.30 for college and we had left about 10.30 for a day out with Desmond and Phyllis, and a hospital appointment in Ammanford. We followed the water tender from Simpson Cross with growing anxiety , about 5 – and the sight greeting us was one we will never forget. The fire had started in Paige’s sitting room and intense heat, but not a blaze, burnt or melted pretty much all that was there and blackened the rest of the flat. What saved the rest of the house was fire proof ceiling tiles and the new fire door in the corridor. Strangely this was the same room as the fire in 2002 (? ), and like that one, no cause has been found, despite extensive investigations by all concerned. Other curious coincidences: the first fireman into the house was part time St Davids man and baptist minister, Geraint Michael, who officiated at Will’s wedding. Richard and Maureen Langston rang to say they were coming down on the Friday, not knowing there had been a fire.He recommended using an assessor to help us with the claim, as he had done, and it turned out to be the same company who had phoned at 8 pm the same night as the fire and despite being given short shrift arrived from Somerset the next morning to be given short shrift again. But we decided to use the firm anyway and the same team worked on it as before. The damage from the smoke and water meant that all the ceilings and walls under the lounge and down to the ground floor had to be removed and what appeared to be a limited repair took five months and we couldn’t reopen until easter 2016. Fortunately we were able to remain on the site and live in the new cottage at the back. So ‘Police investigate the blaze at Cuffern Manor’ as the local paper of historical record, the Herald, headlined the story, was only correct in one out of three respects. When everything was restored we were able to update certain features. Stokes: Many Stokes in the county. And in Roch. Married Frances Warren of Trecwn. Two sons John and Henry (who married Ann Phillips of the Lort Phillips – and his home was Scotchwell and his son Admiral John Lort Stokes). He married Sophia Ellen Gray , of the British Museum– settling £8000(about £500k now) on him in 1847 – with one daughter Emma.Her father was a distinguished Keeper at the Museum and mother a published illustrator. He was a chef. Two girls , Emma and ? Created a Nursing Home. Removed all traces of the historic interior. Two sons. Now living in Chepstow. Also Maureen’s brother Eric. His illness and their exhaustion led to the reluctant exit. 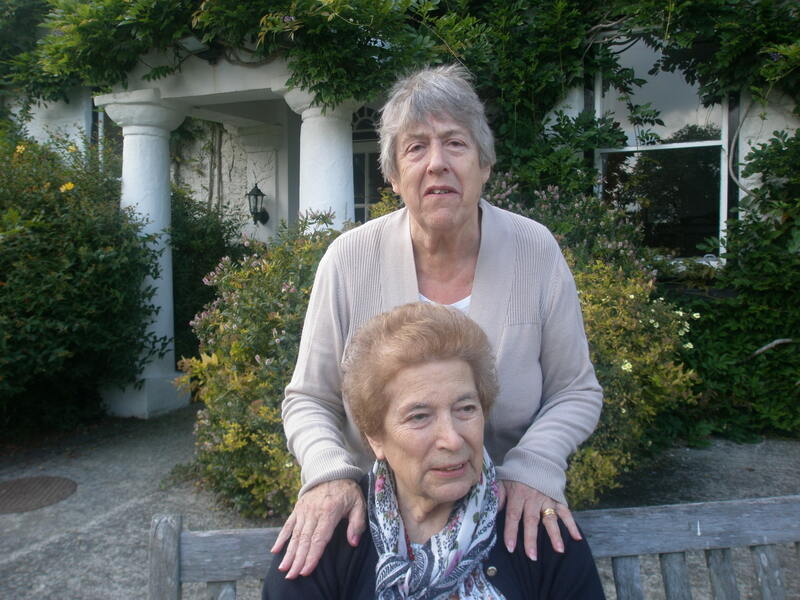 Two sisters (Hazel Williams and Jan Dickenson) who were evacuated to Cuffern Manor in the war.and made a nostalgic return in August 2015. Arriving at Haverfordwest station from Battersea were the Clark family, a pregnant Mum and two children – Joyce, aged 10 and Hazel, aged 5. 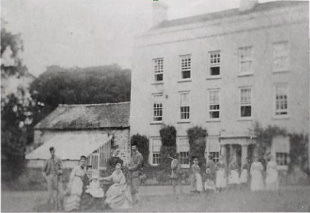 They were taken in by Colonel Higgon and his wife and brought back to Cuffern Manor. Also with them were Mums friend and her son. Col Higgon and his mum (so they said) welcomed them and were extyremely kind and generous. They had a room with cupboards and a bathroom and were taken every week to H’west to spend the money that the Higgons received for having them. When the butcher visited with his pony and trap their Mum would go and choose the meat they needed for the week. The baby, Jan, was delivered at Cuffern Manor. 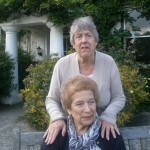 Hazel, seated, and Jan, born in Cuffern Manor, 1941, visiting us in August 2015. 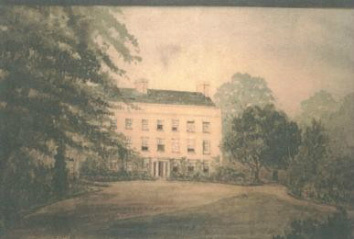 Later they went back to Battersea, maybe to see their father before he went to fight, but then returned and found Cuffern occupied by the army so Mrs Higgon arranged for her friend Mrs Foley-Phillips (Baroness de Rutzen , she was of ‘ handsome stature’) at Ridgeway House Llawhaden ( now a nursing home) to take the family in. She was also very kind and generous. They had the use of a huge kitchen and scullery. In the long conservatory was a section of tree with Nelson’s initials carved. Her dogs Sarah and Tony , were always at her feet. She also took them in the car, driven by Palmer, ‘ man of all trades’, to town, and made sure Mr Voyle, the butcher received a good order when he came calling in his pony and trap. They made friends with the local children and walked to school , two classrooms and teachers and the headmaster, Mr. Lewis keeping an eye out each morning for the stragglers., and Miss Owen arranged bottles of tea around the fire for lunchtime. Their biggest friends were the five sisters from the Johns family, who have remained friends ever since. He was the younger brother of Major John Arthur Higgon, who was the father of the last owner of Scolton Manor. Some time in the early years of the 20th century a young 18 year old girl left her home in Kent and travelled to Cuffern Manor to become governess. Hilda Collins met and married a Mr Devonald, whose cottage stands today in ruins on the causeway just before Gwachel Farm. Later living at a cottage in Ferny Glen Hilda gave birth to a son, Bill Devonald, who. now aged 83 is responsible for keeping our oil central heating going. Research time has been limited so few developments here. We have been given a copy of an aerial picture made in the 1970’s which shows some interesting features, the extension on the east side, the swimming pool ,tennis court. and stables Mike and Grace Penfold, who lent the picture both claim to be the figure toiling in their private garden outside the walled garden. We visited Cottesmore house and its present owner, Charlotte. Charlotte’s parents bought the house from the Massy family 40 (?) years ago. One of the Massy sons married a Stokes daughter and were the last occupants of Cuffern Manor before it was sold to Col Higgon. We searched the Massy papers at the National Library of Wales and discovered some interesting maps and photographs. The 1778 estate map done for John Rees Stokes by Charles Hassell, an 1812 estate map of land to the east owned by John Jones Esq. and also three previously unseen photos from before the Ist world war. A summary of an article appearing in the Western Telegraph on 19th December 1894: A long article, obviously causing a considerable stir at the time. In short a widow, Mrs Hester (Hetty) Morris, occupied a cottage at Dirty Pool on the Cuffern estate with four young children. The description of the cottage is vivid – a real hovel, 11ft by 9 ft with earthen floor. Hetty’s husband had died and she scraped a livingas a farm labourer on the Cuffern farm (tenant Matthew Reynish), wages were dreadful and conditions even worse but that was NOT the problem. She had been left with three children but then produced another illegitimate child. Mrs Sophie Elizabeth Stokes of Cuffern Manor did not approve of this immoral behaviour and tried to have her evicted and when Hetty appeared to object and claim a tenancy, she sent workers in to remove the roof of the cottage. Mrs Stokes then stopped anyone in the village from giving her shelter. Hetty walked in the pouring rain to Haverfordwest to seek help from the Chief Constable, who was absent, returned home to fond the children in the unroofed cottage, wet through. This episode seems to have caused a furore with the Camrose police constable being very sympathetic. Mrs. Stokes seems to have gone away after issuing the deroofing order but her daughter and son-in-law, the Masseys, did make efforts to repair the cottage and provide some other help. We belong to the Pembrokeshire Historic Gardens Trust and Gerry Hudson who is recorder for the group has lent us the Cuffern Manor file, compiled by him at the time of a visit in 1999. The picture (right) which we’d not seen before was there. As I understand it the parapet , seen here, was destroyed in the 1899 fire . The 1891 census records the house occupied by Sophia Stokes ( the same tormentor of Hetty Morris) aged 78 and her daughter Emma and son-in-law Arthur Massey. Then they had 3 children—the eldest Hugh was then aged 7, Herbert 6 and Charles 3. There were 8 live in servants, consistent with the size of household here. This seems to date the photo well. Cuffern comes from the Welsh word Coffrwm. From the 12th century the manor of Cuffern had connections with the Knights Hospitallers of Slebech. In the 15th century it was still listed amongst their possessions. The manor of Cuffern, distinct from Roch, had several landowners. In 1770 the present house was built by a member of the Stokes family. 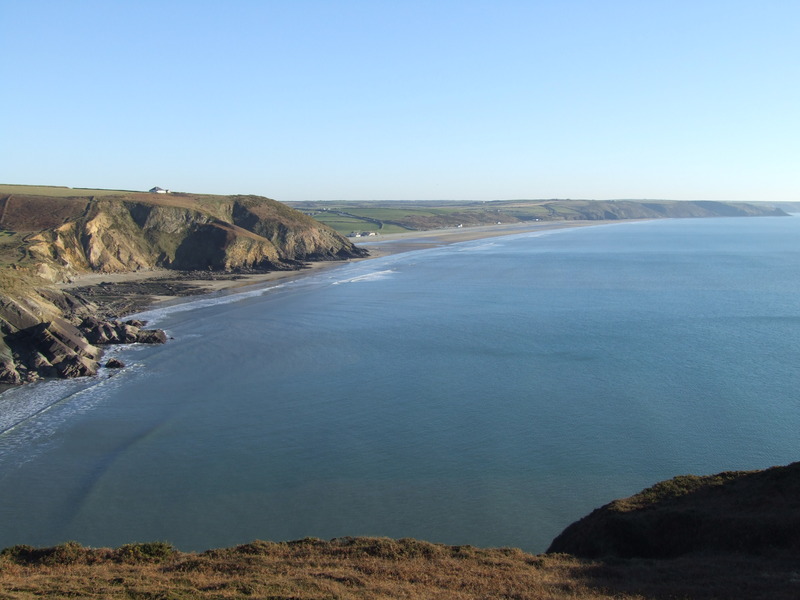 In 1691 one Antony Stokes, described as a Gent, claimed a messuage and 190 acres at ‘Coffrom’. By 1775 John Rees had adopted the name John Rees Stokes when he married Frances Warren of Trewern and he is the presumed builder of the house. A record of 1837 shows the estate consisted of 240 acres of land with the manor, the 94 acres of Cuffren Farm, the 114 acres of the mountain and the 95 acres of Start farm. In 1963 the manor was being used as a hotel. We have found some bar stools in the wood and one friend has told us how her father first ate caviar here, either a special occasion or their usual fare. The swimming pool in the front of the house and the tennis court inside the walled garden were presumably part of this era rather than that of the later nursing home! There was a time when it fell into disrepair and in 1986 the interior was refurbished to provide for the nursing home, which it remained as until 2000. The extension was probably built around 1986. The current owners Jayne and Julian Rutter from Bath bought the house in 2004. In December we spent a pleasant few hours in the company of David Butler, once hotel owner here, circa 1966-74. He was an aircraft engineer from the Midlands who had worked for Lockeed and GEC.